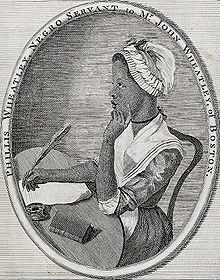 Born circa 1753 in West Africa, Phillis Wheatley was kidnapped by slavers in 1761 and taken to America on the slave ship Phillis, from which she gained her first name. She was purchased in Boston by a wealthy merchant, John Wheatley. He and his wife treated her more like a daughter than a slave. Educated by them, she was reading the Greek and Latin classics by the age of 12. Beginning to write poetry, in 1775 she wrote a poem celebrating George Washington. If you should ever come to Cambridge, or near Head Quarters, I shall be happy to see a person so favoured by the Muses, and to whom Nature has been so liberal and beneficent in her dispensations.